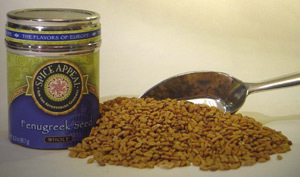 Also known as “Greek Hay” and “Goat’s Horn,” these bitter tasting seeds mellow in flavor when they are lightly roasted or fried, and begin to take on a taste comparable to maple syrup. Used in Southern Indian and Southeast Asian fish curries and dals, as well as a variety of vegetarian stews. Added to sweets and breads in Ethiopia and Egypt.